Dyeing eggs with vegetable materials takes more time than using commercial egg dyes, but it is truly amazing to see the colors hidden in the plants around us! 1. 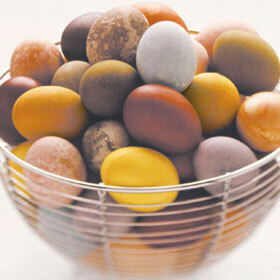 Wash and rinse eggs before dyeing to remove any oil or coating which may prevent the dye from sticking. 2. Put plant material in a small saucepan. Use enamel or glass, as metals will affect the colors of the dyes. 3. Add just enough water to cover plant material. Add 4 Tablespoons of vinegar and 2 Tablespoons salt and boil for 30 minutes. 4. You can now add eggs and more water if needed to cover. Continue boiling to use the hot dyeing technique or remove from heat and let cool to use cool dyeing technique. Boiling eggs in the dye creates darker colors. For more color allow eggs to soak in dye overnight. Cold dipping produces soft translucent shades. The eggs and dyes are boiled separately and the eggs are placed in dye after both have cooled. Rotate eggs to avoid uneven coloring. Batik eggs are multi-colored. Cut out designs from masking tape or use vinyl stickers to cover parts of the egg. Dip eggs into dye. Remove from dye and blot any drips. Remove tape when eggs are dry. Apply more covering and repeat the process. Start with the lightest colors and progress to the darker. If you want to keep an area a certain color, you need to keep it covered. Use crayons or paraffin to create designs or drip melted wax to cover areas of the egg. To create half and half eggs dye entire egg in a boiling bath. Place egg and cold dye in a small cup. Prop the egg against the cup to allow only half the egg to be in the dye. The second color needs to be darker. Onion wraps: Rub eggs with vinegar and wrap in onion skins. Secure the skins with cotton string, dental floss or narrow rubber bands and boil. Use many layers of onion skin to create a deep and rich color. Pre-dampening the skins helps them to stick to the eggs. Plaids and stripes: Dye eggs wrapped with rubber bands. Allow to dry and remove rubber bands. Wrap with more rubber bands and dye with another color. Repeat until you have achieved desired result. Tips: Try rubbing your eggs gently under warm running water after removing from dye bath to create different effects. After your eggs dry, rub with vegetable oil and a soft cloth to obtain a deep and glossy finish.